In light of recent tragic events in Pittsburgh, Thousand Oaks and around the world, the Chabad Jewish Center of Snohomish County invites you to celebrate the Festival of Lights with a Grand Menorah Lighting and Chanukah Celebration at Lynnwood City Hall, celebrating the light and joy of our shared freedoms and the immeasurable value of every human being. 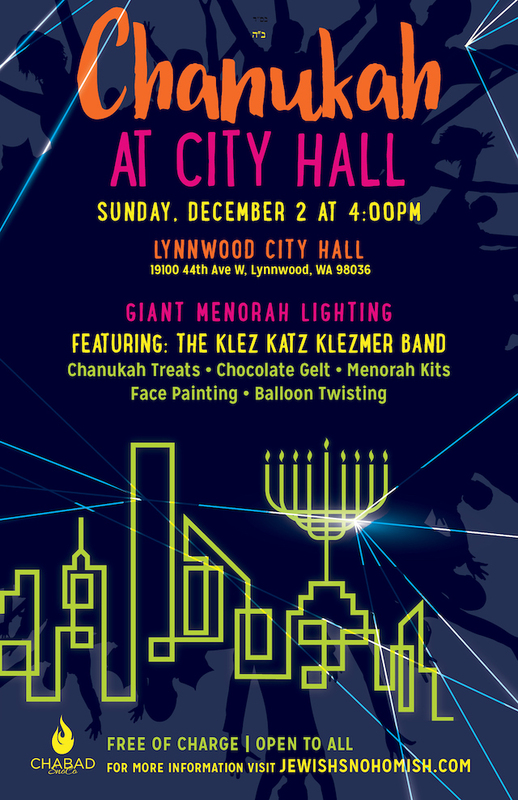 The Seventh annual Lynnwood public Menorah Lighting Ceremony will take place at 4:00pm on Sunday, December 2, at the Lynnwood City Hall 19100 44th Ave W, Lynnwood 98036. The event will feature speeches by the Rabbi of the Chabad Jewish Center and local dignitaries, as well as the kindling of the giant nine-foot Menorah, delicious Holiday treats, face-painting and balloon-twisting for the kids and (for the second time) a musical performance by the Seattle based Klez Katz Klezmer band. Join the community at a public display of unity at this exciting Menorah Lighting Ceremony. Bring the kids and make this your special Chanukah celebration. We encourage everyone to bring a candle to light in unity. Chabad Centers all around the world are dedicated to spreading light and goodness in their respective communities. Chabad’s answer to the darkness and destruction is an increase in light and warmth. The Jewish Center will host a public community-wide Chanukah celebration where the message of religious freedom is brought to the street. The kindling of the Menorah each night of the holiday highlights Chanukah, a celebration for all time. "It is a holiday that enriches our lives with the light of tradition," said Rabbi Berel Paltiel, director of the Chabad Jewish Center. "In ancient times our ancestors rededicated the Temple in Jerusalem with the Menorah. Today, we rededicate ourselves to making this world a better and brighter place." Chanukah also propagates the universal message that ultimately good prevails over evil, freedom over oppression and light over darkness. In its Chanukah outreach campaign, Chabad of Snohomish County joins thousands of Chabad centers across the globe that are staging similar public displays of the Menorah and its symbolic lights. From Australia to Africa, Columbia to Hong Kong, New York City’s statue of liberty to the White House lawn, hundreds of thousands will experience the joy of Chanukah with Chabad. For more information, contact the Chabad Jewish Center at (425) 787-2770.